As part of the celebration of their 100th anniversary, the Minneapolis Institute of Art has commissioned art into reality by transforming a large plot of land into a living Van Gogh painting! 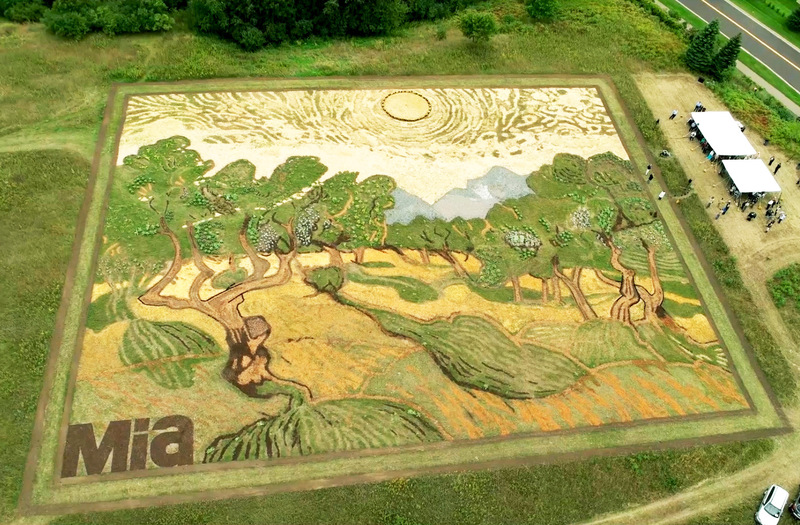 Created by landscape artist Stan Herd, the large-scale replication of Van Gogh’s famous “Olive Trees” painting was created through the use of native Minnesotan plants, and spans an area of over 1.2 acres on the Thomson Reuters campus in Eagen. The work has been in progress since this past spring, when Herd planted the wide variety of seeds needed to recreate Van Gogh’s iconic brushstroke art style, such as grass, oats, and other plants. The landscape art is purposefully located near the Minneapolis-St. Paul International Airport, where fliers can see the painting in its full glory from an airborne perspective. For the rest of us on the ground, make sure to visit this piece of living art while you can, since the piece will eventually wither and disappear with the passing of autumn. Don’t worry if you miss out; you can also check out the real “Olive Trees” painting and other classic works of art at the Minneapolis Institute of Art!